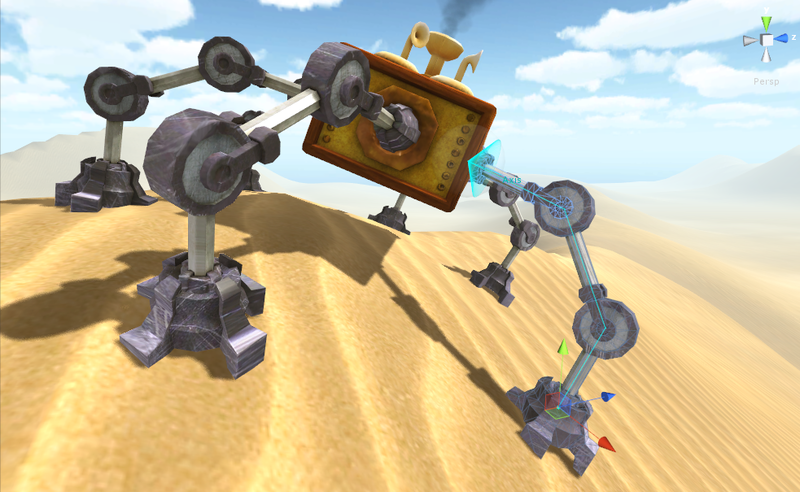 CCD (Cyclic Coordinate Descent) is one of the simplest and most popular inverse kinematics methods that has been extensively used in the computer games industry. The main idea behind the solver is to align one joint with the end effector and the target at a time, so that the last bone of the chain iteratively gets closer to the target. CCD is very fast and reliable even with rotation limits applied. CCD tends to overemphasise the rotations of the bones closer to the target position (a very long CCD chain would just roll in around it's target). Reducing bone weight down the hierarchy will compensate for this effect. It is designed to handle serial chains, thus, it is difficult to extend to problems with multiple end effectors (in this case go with FABRIK). It also takes a lot of iterations to fully extend the chain. Monitoring and validating the IK chain each frame would be expensive on the performance, therefore changing the bone hierarchy in runtime has to be done by calling SetChain (Transform hierarchy) on the solver. SetChain returns true if the hierarchy is valid. 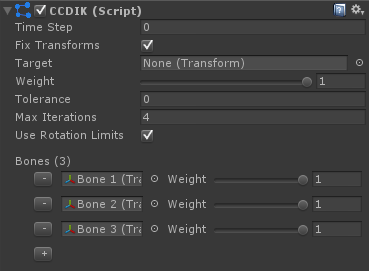 CCD allows for direct editing of it's bones' rotations (not by the scene view handles though), but not positions, meaning you can write a script that rotates the bones in a CCD chain each frame, but you should not try to change the bone positions like you can do with a FABRIK solver. You can, however, rescale the bones at will, CCD does not care about bone lengths. Assign all the elements in the chain to "Bones" in the component. Parents first, bones can be skipped. Simply add a Rotation Limit component (RotationLimitAngle, RotationLimitHinge, RotationLimitPolygonal or RotationLimitSpline) to a bone that has been assigned to the "Bones" of the CCDIK component. Note that each rotation limit decreases the stability and continuity of the solver. If CCDIK is unable to solve a highly constrained chain at certain target positions, it is most likely not a bug with FinalIK, but a fundamental handicap of the CCD algorithm (remember, no IK algorithm is perfect). tolerance - minimum distance from last reached position. Will stop solving if difference from previous reached position is less than tolerance. If tolerance is zero, will iterate until maxIterations. bones - bones used by the solver to reach to the target. All bones need to be sorted in descending order (parents first). Bones can be skipped in the hierarchy. The bone hierarchy can not be branched, meaning you cant assing bones from both hands. Bone weight determines how strongly it is used by the solver.